Membership in our Guild and our parent organization, the Catholic Medical Association, affords you an opportunity to find fellowship with like-minded individuals, receive spiritual support to face the challenges before us, and attend medically and ethically relevant presentations by experts in the science and the practice of medicine. 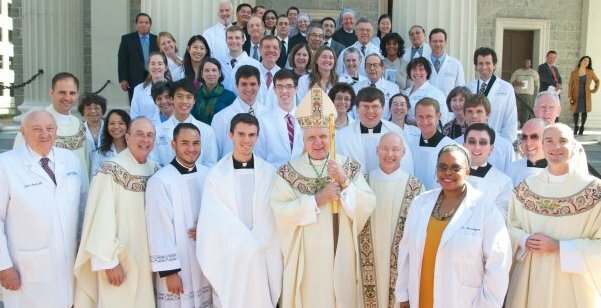 Our Guild celebrates an Annual “White Mass” for medical professionals, has spiritual retreats throughout the year, fosters students in training, and participates in lectures and discussions by experts often with CME accreditation. Now more than ever it is necessary that we bear witness to our Faith and principles not only to those steeped in our secular culture but even among our colleagues. As former Archbishop and now Edwin Cardinal O’Brien once enunciated during a homily at one of our Annual White Masses, “…you good Catholic Medical professionals must persevere; stay the course in attacking the moral leprosy within your own noble community”.